So I really thought the new 9.7″ iPad Pro would be what finally sold me, but between listening to so many podcasters gush about the 12.9″ iPad Pro, and seeing how amazing the split view/multitasking is in person, I’m not so sure anymore. I definitely like the size and weight of the smaller, 9.7″ model, and it’s unquestionably the better size for reading in bed. But split view isn’t as incredible, and it lacks the fast-charging with the 29W USB-C adapter. Regardless, thanks to the Apple Pencil and Smart Keyboard, I’m definitely tempted to just forgo a desktop computer altogether for a iPad Pro. Please apple, just give us a compiler/Xcode for iOS at WWDC this year. While you’re at it, local, encrypted backups without iTunes (e.g. To a flash drive using the new USB to lightning adapter) would be great too. Now to find a purse large enough (but still stylish!) to carry around such a monster of a tablet. SFX Power supply for Titan Z? Yep. 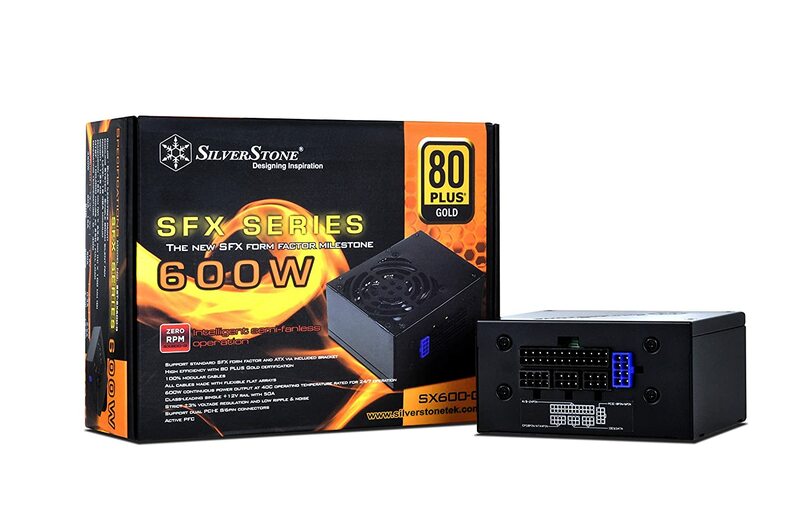 Well, for anyone else out there considering an SFX/small-form-factor build, the new Silverstone 600W, 80-Plus Gold, Fully modular, SFX power supply is finally available on Amazon. Honestly I’m surprised by how cheap it is, I was expecting ~$159+ before tax and shipping since this is a first of it’s kind, semi-passive, 600W SFX power supply. I mean, this can power a 4790k and a GTX Titan Z. So after countless mind-boggling threads over the last two days, I’ve realized most people have no clue how important underlying technologies work, and accordingly, I forgot to mention quite a bit in my critique of the new Mac Pro, so here’s part two! To alleviate fears of zero expansion options, Apple is going to ship the new Mac Pro with six Thunderbolt 2.0 ports, so let’s recap a little on thunderbolt. Thunderbolt is basically an external pcie interconnect, and it runs at pcie 2.0 x4 link-speeds. Thunderbolt controllers can present one or two ports, depending on the controller used, though there’s little to no technical data on how the controller is “doubling” bandwidth to present two ports, my best guess is built-in, intel designed, pcie multiplexing akin to popular PLX 8747 chips. Thunderbolt 2.0 and 1.0 run at the same pcie link speeds, though 2.0 combines previously separate data and display channels into a single bi-directional channel to effectively double bandwidth from 10Gbps (or ~1GB/second) to 20Gbps (~2GB/second.) You can expect that 2.0 will require all new cables, and all new peripherals, else the ports will almost certainly drop back down to 1.0 compatibility modes, or simply fail to work with 1.0 peripherals at all. While there’s no technical data available for falcon-ridge (thunderbolt 2.0) we can assume that intel has both single-port and dual-port variants like they did with previous generations. So now we need to try and figure out if apple is using 1-port or 2-port controllers for the new Mac Pro, and it’s immediately clear that apple is most likely using dual-port controllers. This is due to the fact that we have 6 pcie 3.0 lanes (equivalent to 12 pcie 2.0 lanes) leftover, exactly the number required to run three dual-port controllers (based on previous generation requirements.) So we have to expect that all six thunderbolt ports will have added latency from whatever internal multiplexing intel does on dual-port controllers. Ok, all of that out of the way, let’s actually get back to some of Apple’s new reality-distortion-field marketing! Apple claims that the Mac Pro can support three 4K displays at the same time. Ok, well, I’m going to assume they mean Ultra HD (3840 x 2160) resolution and not Cinema 4K (4096 x 2160) even still, the bandwidth required to drive a single Ultra HD display, at only 60Hz, is ~1.5GB/second. In other words, if you want to use a 4K monitor with the new Mac Pro, you won’t want to daisy chain any device between the computer and the display, else you might bottleneck the display of the bandwidth it needs, especially since there’s already added latency from the dual-port controller. EDIT: To add to the above, this assumes that the “4k” displays are all thunderbolt 2.0 compliant, since thunderbolt 1.0 lacks the bandwidth necessary to push 4k @ 60hz. And now if we take that “three 4K displays” claim a bit further, and we see that of the six thunderbolt ports, we now have only three left for actual expansion. So far this seems reasonable enough, though it’s questionable if even dual FirePro W9000 series GPU’s could truly drive three 4K displays without problems, especially while trying to perform GPU heavy workloads concurrently. Now, here’s the real interesting part. Going back to the fact that all six thunderbolt ports most likely run over only six shared pcie lanes. Assume all 5 of those ports in-use are operating at near capacity, that’s 1.5GB/second for each display (so 4.5GB/second total) and another 1GB/second for the capture card, and another for the 10Gbe NIC. That’s already 6.5GB/second. Now assume you actually have all 2.0 compliant peripherals, and all six ports can operate at full 2.0GB/second, that would be 12GB/second, all running over 6 pcie 3.0 lanes, with a hard bandwidth limit of ~6GB/second. Yep, absolutely no way of avoiding that latency and potential bottlenecking, both very valid (and worrying!) concerns for would-be workstation class computers. Anyway, I just hope this causes someone to see through Apple’s reality-distortion-marketing and look at the Mac Pro objectively. It’s an “epeen” toy for rich people, or people that have absolutely no choice but to use Apple hardware due to contractual obligations, corporate investments, etc. So yesterday was the opening day (and keynote presentation) of Apple’s “WWDC” 2013. Among other things (like trying to spin OSX playing catch-up to Windows as new features; e.g. GPU scaling, functional multi-monitor support, and new low-level CPU optimizations) they offered a sneak peak at the forthcoming Mac Pro refresh. I suppose I shouldn’t have expected much, this is the “New Apple” after-all, but it seems like they’re just completely ignoring the “Pro” market entirely. So who is the system for then? Audio engineers? Why would they need dual fire-pro GPU’s? Mechanical engineers? Well, maybe for any apps that don’t rely on CUDA. Maybe 3D artists/designers/animators? Again, maybe for apps that don’t rely on CUDA (no 3Dsmax, Blender etc.) Maybe professional video editors? Apple has pushed the Mac Pro for the editing market for a long time, so let’s see! Assuming that Apple allows up to ~1TB of SSD storage in the new Mac Pro, that’s ~970GiB (GiB = Gibibyte, unit used to represent base2 formatted computer storage, vs base10 used in most marketing.) Let’s assume that ~70GiB goes to the OS, Apps, Library files, temporary files, etc., and that leaves ~900GiB of “scratch” space to work on files. That’s only ~17 minutes of uncompressed 4K/24p video and the disk is completely full, and that ignores the fact that a full SSD is considerably slower than rated speeds (a general guideline is always leave ~20% free space on your SSD to ensure consistent performance) and will in turn negatively impact the entire system performance. I know what you’re going to say now though, that’s where thunderbolt comes in! Well, yes and no. It’s true that thunderbolt is almost an external pcie interface, but each port (even version 2.0) is limited to the bandwidth of a single pcie 2.0 x4 link, meaning a real-world throughput of ~2GB/second. Compare that with an internal pcie 3.0 x8 link (the interface used by most high-end RAID controllers) at ~8GB/second; four times the bandwidth of thunderbolt 2.0. So for truly high-speed storage (like you’d want and need to comfortably edit 4K video) thunderbolt just can’t match a local/internal RAID array. And let’s not forget that thunderbolt 2.0 peripherals aren’t even close to market yet, and when they’re released, you can expect a disk-less RAID array to be ~$1500-2000+ for the first couple of years. Ok, so how about using a network storage solution? Surely $2000 could build a capable, high-performance NAS/file-server, even with a 10Gbe connection. True, it most certainly could, except there’s no internal expansion of the new Mac Pro, and it doesn’t have a native 10Gbe connection. And 1Gbe can’t handle the bandwidth to do real-time editing of even 1080p uncompressed video. So back to thunderbolt, yes, it can handle a 10Gbe card from a bandwidth standpoint, but the cheapest one I can find is $1000 (compare with internal 10Gbe cards as low as $275 now) and being an external breakout box will need it’s own desk space, cable, etc. And of course, since it’s only designed for thunderbolt 1.0, you won’t want to daisy-chain the 10Gbe adapter, because you don’t want the added latency, or potential bottlenecking from sharing bandwidth. And lastly, this all ignores the fact there’s very few thunderbolt capture cards on the market, even fewer that support 4K, and those that do (for professional level work) need an external rack to mount them, limiting any semblance of portability you may have gained with your tiny new Mac Pro. Wow, this new setup is so much better than dropping a couple pcie x1/x4/x8 cards into expansion slots. So I just don’t see a market for this computer, I truly don’t. It will be another toy for rich people to flaunt their money, but it won’t find traction in real professional environments.